Mormon Wookiee: #77: The Challenge of Infertility. Although I really enjoy blogging about the events in mine and Diane's lives, most of the time I don't get very personal. Instead, I try to keep things lighthearted (and hopefully funny) by focusing on easy topics like vacations, date nights, or ward activities. However, after some encouragement, today I decided to post something very personal. 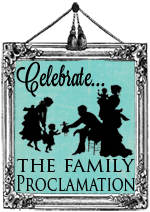 Each year in September, my favorite blogger/mentor, Jocelyn Christensen, hosts a 13-day blogger event celebrating "The Family: A Proclamation to the World", in which she collaborates with a few other big LDS blogs and invites smaller bloggers to guest post about topics related to the family. A few months ago, Jocelyn asked me if I would like to participate in this year's family celebration, and I eagerly accepted. But, after my initial excitement, I was stumped as to what I should write about. I thought that maybe I could write something clever and superficial about Star Wars families, but it just never seemed right for the occasion. I knew that Jocelyn's celebration of the family was meant to inspire and encourage people, not just be funny. After praying with Diane and then discussing it with Jocelyn, we felt that it would be appropriate to talk about something that has been a significant part of our marriage--the challenge of infertility. If you would like to read the post, please click here to follow the link to Jocelyn's blog. Our greatest hope is that our story will be able to help others who may be struggling. For those of you who were already aware of this challenge, Diane and I wanted to thank you for your prayers, fasting, and love. We are blessed to have some of the greatest family and friends in the world! Steven - read your post on the other blog, but thought I'd leave my comment here. We love you and Diane and pray your miracle comes very soon. Whenever it comes you will be marvelous parents. I'm so glad you found Diane and that your faith and marriage remain strong amid such a terribly difficult trial. I took ask myself why people like you are unable to get pregnant when it comes to easily for others. Your faith and goodness inspires me to be a better person. Thanks Anna. Not only were you a great junior prom date, you are also a great friend. :) Diane and I are so grateful to be friends with you and Joe. We love you guys. Ha! I'll see what I can come up with. Thanks again for letting me be a part of the Family Celebration! You will always be my blogging hero! Steven- That post was great! You and Diane are two of the greatest people I know. You both are so amazing and wonderful and I always feel uplifted and happy when I see you! I am not sure I have ever met two people more perfect for each other. Your children are going to be incredibly lucky to have you both as parents! We will continute to pray for you guys! Thanks Allie! We love you guys. Thank you for sharing the heartache that you are going through. When I read your post it was like going back in time for me. I too went through the infertility process and I am here to tell you to never give up! After 7 years of marriage and many rounds of artificial insemination, we were blessed with amazing twin boys. Nine years later (more treatments & clomid) we were given another son and 2 years after that (with no help) a beautiful baby girl. They each came when it was their time to be here on earth and we are so thankful for them. Never never give up! Thank you for your encouragement. It's always comforting to know that we are not alone. Thank you, Mishelle! I haven't talked to you in ages! How are you doing? Thanks for your insightful look at infertility. My husband and I were at the same fertility party and I totally remember you guys names being called. We were so hoping to win as well :) This road is long and rough. We have four failed IVF cycles and just adopted a one year old. This was not the path I would have chosen, but I am glad to have the strength to make it through. Good luck to you and your wife.